SUMMARY: "The purpose of business is to create and keep a customer," according to Peter Drucker. 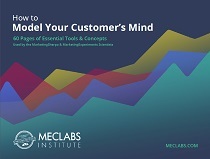 To earn and keep a customer, you must look beyond your own products and services to the fundamental question underlying all marketing -- what do customers want? This week, we take a MarketingSherpa look at how companies try to answer that question. "Do you have any white papers or material that show how prevalent testing is at large enterprise companies (or in general), Fortune 1000, etc.?" Jake is a brilliant Web marketer. You can learn more about the SAP Test Lab he is running with Shawn Burns, VP, Digital Marketing, SAP, in "Testing: A discussion about SAP's 27% lift in incremental sales leads." If Jake wanted to know this information, I thought readers of the MarketingSherpa Chart of the Week might want to know as well. Q: Which of the following does your company employ to learn about customers? Check all that apply. As you can see, internal metric analysis — reviewing past performance using data sources like Web analytics and transactional data — is the most commonly used tactic to learn about customers. Some marketers are very passionate about this data. For example, when asked, "What, if anything, have you (or your organization) learned about optimizing specific webpages?" one marketer simply replied in the survey, "Analytics, analytics and analytics." While metrics can be very revealing, we have to be very careful in how we use metrics. Dan Rather and other news anchors had a great career in telling you what already happened. However, Al Roker and fellow weather forecasters have a bigger challenge — predicting the future. "Analytics help point us to the treasure. A/B testing helps us find the gold," Scott Calderwood, Senior Marketing Manager, Digital Online Strategy & Services, SAS, stated. 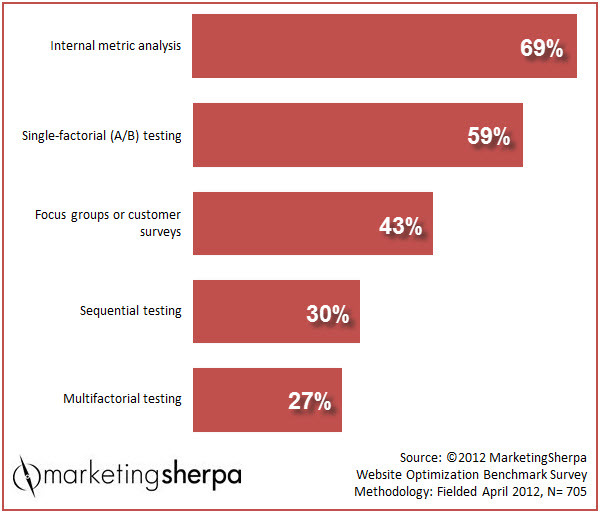 As you can see in the Benchmark Report survey results, while reviewing what already happened is the predominant way to learn about the customer, many marketers are also engaged in split testing to see what works right now — both single-factor (or A/B) testing, with 59% of marketers testing in this way, and multifactor (also known as multivariate) testing conducted by 27% of marketers. The biggest takeaway when it comes to building customer knowledge is testing is important to help you implement lessons from metrics into practice and discover what really works. But you must keep in mind that people inherently change over time. As one marketer responded in the Benchmark Report survey, "Repeated testing is necessary as the user behavior changes in time." Marketing Research Chart: Does A/B testing deliver a positive ROI?